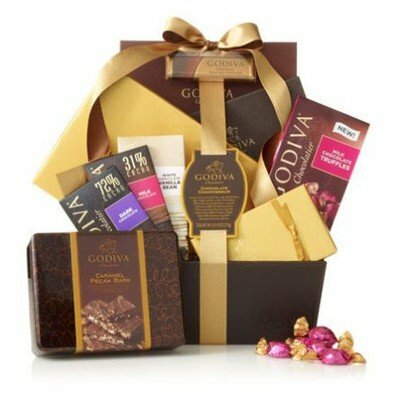 Our Chocolate Connoisseur Gift Basket will delight the ultimate chocolate lover in your life. Features the 36 pc. Signature Chocolate Truffles Gift Box, 36 pc. Gold Ballotin, 16 pc. Dark Chocolate Gift Box, 8 pc. Gold Ballotin, Caramel Pecan Bark Gift Tin, Individually Wrapped Milk Chocolate Truffles, Large White Chocolate Vanilla Bean Bar, Large 31% Cacao Milk Chocolate Bar and Large 72% Cacao Dark Chocolate Bar. This gourmet gift basket is packaged in a faux leather base tied with white Congratulations ribbon and adorned with a Small Solid Milk Chocolate Bar. (4 lbs., 15.9 oz. ).